Atop a hill in the small town of Podgarić, the monument towers over an artificial lake below. 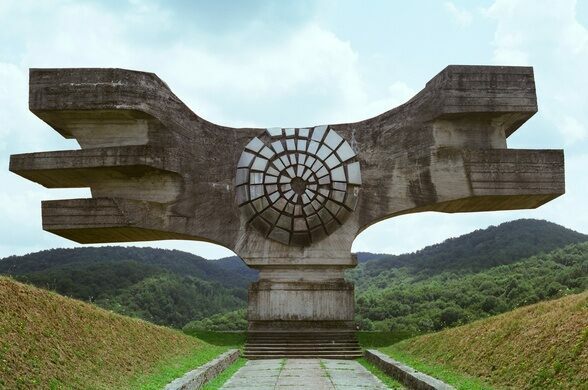 The monument was commissioned by Tito, Yugoslavia’s long-time dictator, who commissioned a number of similar monuments to World War II sites throughout Yugoslavia. Most of the sites were former Yugoslav Partisan memorials, the party which Tito was involved and who took over after the war. The abstract monuments were meant to symbolize power and triumph, but were poorly maintained after Yugoslavia fragmented. The Podgarić Monument receives occasional upkeep, but is doesn’t get much traffic.